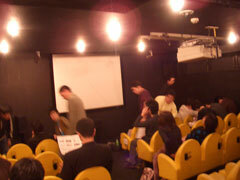 EPOC, Tollywood Theater, ”Best of Annecy 2005”, Tokyo. Goteborg Film Festival, Sweden (Premiere Jan 2005). Krakow International Festival of Short and Documentary Film, Poland. Annecy Festival of Animated Film, France. Archipelago, Festival of Short Film and New Images, Rome, Italy. Edinburgh International Film Festival, Ireland. Eksjo Festival of Animation, Sweden. Leipzig International Festival of Documentary and Animated Film, Germany. Imago Film Festival, Fundao, Portugal. Sitges International Film Festival of Catalonia, Spain. EAARC Animation Series at The Red Cat, Los Angeles, USA. Cork international Film Festival, Ireland. EPOC, ”Best of Annecy 2005”, Tokyo. Les Nuits Magiques, International Festival of Animated Film, France. Leeds International Film Festival, England. Fox Days Film Festival in Helsinki, Finland. Vendome International Film Festival, France. DaKino Bucharest International Film Festilval, Romania. Animateka Kinodvor in Ljubljana, Slovenia. Cinéma Nordique i Rouen, France. Istanbul international Short Film Festival, Turkey. Tampere International Short Film Festival, Finland. On tour around France organized by Centre Image in Château-Renault: Châteauroux, Richelieu, Orléans, Blois, Le Blanc, Bourges etc. Nuit la plus court, Paris. France. Ung Film på Lava, Stockholm, Sweden. The MULTIVISION animation festival, St Petersburg, Russia. Animatricks Animated Film Festival, Helsinki, Finland. Oyakino on the Oya Festival, Oslo, Norway. 12th Festival of European Films, Festival on wheels, Turkey. Osterby Short Film Festival, Dalarna, Sweden. Bildfest för barn och ungdom, Åland. Tempo Dokumenträr Film Festival, Stockholm, Sweden. 'Through A Panel Darkly' cartoon exhibition at the Swedish ambassy in Tokyo. Japan. Kimmos Vänkväll, Biografen Tellus, Stockholm. Sweden. Svensk Retro/Best of the 00-decade.Goteborg Film Festival, Sweden. Cinemateket/ Lunchbio Filmhuset i Stockholm, nedslag i kortfilmshistorien, 2013. Svensk Animation fyller 100 år, Cinemateket. Nordic Shorts/Scandinavian House, Prag, Tjeckien 2016. 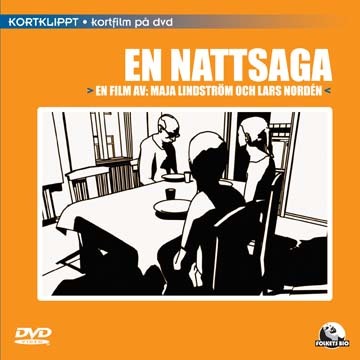 En nattsaga is part of a a worldwide animation encyclopedia Il était une fois le dessin animé written by Olivier Cotte, 2015.